Kiddie Rides provide an outlet for families with autistic children. Who knew? Dan Snook gets schooled at EAG. It’s not terribly often that heart-warming, human-interest stories get column inches in our industry – it’s normally about who’s making the most money, doing what and where. Which is fine for the most part, because, let’s face it, that’s what we’re here for. But every now and again, it’s nice to share a bit of insight into aspects of our business that we don’t often hear about. On that note then, lets talk about kiddie rides, cranes and autism. I bet that wasn’t a sentence you thought you’d read today. Turns out though that the three have a closer relationship than you would imagine. How right you were, Richard. “Autistic children seem to get fixated with amusement machines, particularly kiddie rides, he said. “I’ve been in this business for over 30 years and the knowledge that these kids possess that are here today puts me to shame. So Amber Jones, 14 (nearly 15!) lives in Chester in the north-west of England, quite some distance from the capital and its coin-op trade show, but it just so happened that the young kiddie ride fan found herself giving an interview for BBC Radio London. She was there because she’s not just a fan of amusement machines, but also the British actress, Fenella Fielding, who sadly passed away in 2018. Such a fan is Amber that she actually set up an online petition to have Fielding posthumously awarded an OBE (Order of the British Empire) in the Queen’s New Year honours list. She also succeeded! Amber was on the Jo Good show that afternoon and during the interview she told Jo about her fascination with kiddy rides. This then turned into a two hour debate live on air after the host asked her listeners to contact the show and share their experiences and memories of kiddie rides. The show was inundated with calls and emails from people sharing stories and reminiscing about rides from their childhood as far back as the 1950s. When Amber arrived on the stand and was introduced to me, I shook hands with a bright-eyed, smiley girl, dressed in a jumper and jeans. Nothing really to set her apart from most girls of her age. But then autism is a hidden disability and one that is more common than you might think. There are around 700,000 people on the autism spectrum in the UK – that's more than 1 in 100. If you include their families, autism is a part of daily life for 2.8 million people. Amber, as her father Andy explained, is classed as having high-functioning autism so had no problem at all in enthusing over one of the main objects of her fangirl-ism. “I’ve had an interest in kiddie rides since about 2014,” she told me with a huge smile on her face. “I used to be scared of them when I was little. You’d see children in supermarkets riding them and me and my brother Mackenzie were terrified of them! Eventually though, we both became less afraid and more inquisitive. Especially me! “Once I had conquered my fear, when I was around 10, I really started getting into them. I took to searching for them online and I’d see videos on you tube and thought ‘I could do that!’ so I did. I started making them myself." Amber The Fangirl has over 2000 subscribers and puts up a new video about every two weeks. “It depends on what new rides are out there and how often I can get out to see them, otherwise every week,” she said. That the likes of Richard and his team at Northern Leisure are gracious enough to accommodate Amber’s requests for information is something that Dad Andy is immensely grateful for. Despite being well used to the obsession by now, Andy still sounded immensely proud of his daughter (as a parent myself, I recognise the sound of barely-disguised pride in a father’s voice! ), “Amber has a YouTube channel with over 2000 followers and 400 videos just on kiddie rides alone. Some of the videos have amassed over 50,000 views and all the videos together have an incredible 2.3 million views and counting. “She was the first to make contact with kiddie ride manufacturers in the UK such as Northern Leisure, Jolly Roger and Photo Me and they always had a lot of time for her, always replied as soon as they could and were generally really nice. “It wasn’t long before I also got involved and shortly after we were invited to a tour of Northern’s factory, which they didn’t have to do, especially as there are health and safety requirements to be taken into account. They were really open to autism. Andy revealed that Amber emails Richard directly and while some from other companies have apparently asked her to reign in the number of contacts she makes, Northern Leisure’s technical manager always has time for her. “Of course I would never want him to be inundated,” said Andy, “he’s at work and trying to run a business, but he just handles it really positively. At home, Andy said, Amber owns three kiddie rides and her brother, 13 year old Mackenzie (who is also autistic) has two crane machines. “That said, we still have to visit arcades! We travel the country pretty much every week looking for specific rides. I think that combined, autistic families contribute massively to the ride industry in the UK. “From buying rides for private use, to effectively marketing the products - what Amber does raises awareness to what autistic families bring to the industry and those few that don’t understand, or are actively critical of the attention that fans like her give, might just change their mind if they realised the positive impact and exposure she and others provide." While Amber’s condition is high functioning, her brother Mackenzie on the other hand is at the opposite end of the spectrum. Andy explained: “He’s pre-verbal. It’s difficult at times as we couldn’t bring him to an event like EAG because the noise would seriously distress him. “I do realise that autism is a hidden disability and that unless you know, it’s easy to misunderstand kids that have it. It’s not so much that they sit on the rides, it’s more that they stand there and film it, so we do get a few confused questions occasionally and most people are totally ok with it.” Sadly though, there are some whose reaction to a 13/14 year old occasionally riding a product or simply being around them is less than polite, however such appalling interactions are few and far between. While the majority of people the Jones family collectively deal with are generally understanding, Northern Leisure’s attitude towards them is another level and a breath of fresh air in a business that can sometimes be ‘too busy’ for something as basic yet ineffaceable as just being a decent human. “The level of understanding and compassion the we get from Richard and the team at Northern is above and beyond – it helps us as a family immensely and I just think it should be recognised,” said Andy. If you want to know more about autism, please pay the good folks at The National Autistic Society a visit. Want to see the latest insight into kiddie rides? Check out Amber The Fangirl’s Youtube channel. 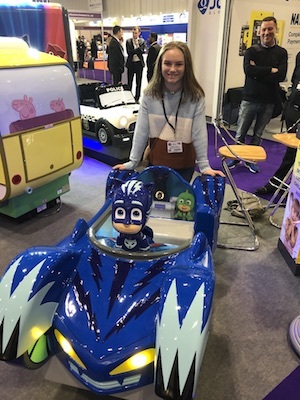 Image: Amber Jones with Northern Leisure's PJ Masks Cat Car. A proud Andy Jones looks on.